Krazy Krouse Kids: Halloween...Not Yet! 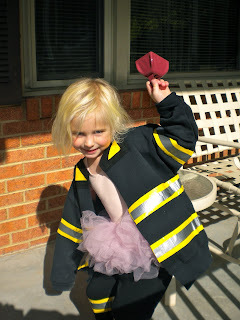 No, it's not Halloween yet, but the kids spent all afternoon in costume. And no, they will not be a firefighter, ballerina, or Spiderman for Halloween. This is just a typical Saturday afternoon with the Krouse kids. Jackson, who is being a tiger for halloween, has been playing lately in a lion costume...must be a kid thing!